eGuide to Cadiz - Clarinda Parques S.L. In Cadiz , the sea, its people, its bay, its history and its joie de vivre . And all this without forgetting the capital of the region, which holds within its walls the culture and the traditions which set the city –and its people– apart. Don’t think twice, Cadiz is the perfect destination for your holidays. This is the southernmost province on the Iberian peninsula, and is only 14 km. from Africa. 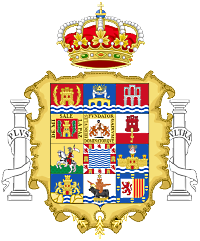 It borders the provinces of Seville and Huelva in the north, the province of Malaga to the east, the Atlantic Ocean in the southwest, the Mediterranean Sea in the southeast, and the Strait of Gibraltar and the British colony of Gibraltar in the south. Phoenicians, Greeks and Romans peopled this province and left behind an important testimony of their presence all along the Cadiz coast. What’s more, a series of historic milestones highlight how closely Cadiz is linked to the rest of the Iberian peninsula: in 711, the Muslims conquered these lands by defeating the Visigoths at the Guadalete river, thus changing the course of history; on three occasions Columbus’ ships set sail from here on his voyages to the New World, and arrived home in these same ports, which over time were transformed into a meeting point for the cultural currents between Andalusia and America; finally, another important event was the signing in Cadiz in 1812 of the first Spanish Constitution, which made the city into the capital of the nation for three years. The remains of the medieval city wall enclose winding Old Town streets that link squares such as flower-filled Plaza de Topete and Plaza de Mina. The latter is home to the Museum of Cádiz, with displays on archaeology, puppets and art. Over time, Cádiz has been inhabited by Phoenicians, Romans and Moors, and a Roman theater was excavated in the 1980s. Walkways pass over the remains of a Phoenician settlement at Yacimiento Arqueológico Gadir. Caleta Beach lies between 2 seafront forts: San Sebastián and Santa Catalina. Nearby Campo del Sur promenade and La Playa de la Victoria are lined with shops and restaurants. Combine the freedom of independent exploration with the convenience of a guided tour on a self-guided shore excursion to Seville. Departing from Cadiz in an air-conditioned coach, you’ll travel past Andalusian villages before arriving in Seville, where you’ll have four hours free time to explore independently. 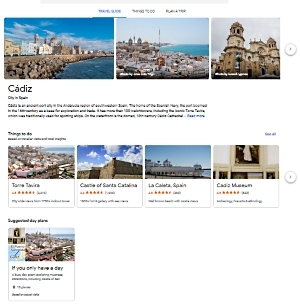 Plus, you’ll take a sightseeing tour of Cadiz on the return. Port pickup and drop-off are included. 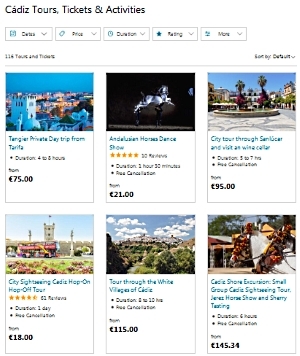 Self-guided shore excursion to Seville from Cadiz. Relax during round-trip transport to Seville by air-conditioned coach. Spend ample free time exploring Seville independently. A sightseeing tour of Cadiz and port pickup and drop-off are included. We are not affiliated with any of our external links. Get to know Cadiz in a day! Parque Genovese, Santa Catalina Fortress, La Caleta Beach, Castle of San Sebastian, Cadiz Cathedral – these sights are all accessible by walk. There is a lovely promenade along the sea that will connect you with most of the sights. 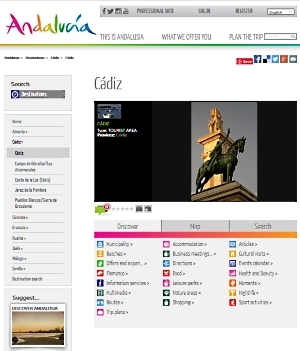 A different trip, the map of Andalusia with spectacular videos ... in our Web! http://canalandaluciaturismo.es Beaches, dunes and salt marshes make up the Bay, a natural and aquatic park where Cádiz is located, surrounded by the Atlantic Ocean. Its waters are cooler than those of the Mediterranean, so it is a pleasure to walk and bathe in them. La Tacita de Plata, considered the oldest city in the West, Phoenicians, Greeks, Carthaginians, Romans and Arabs settled in these lands, mainly for its maritime access. This city offers the visitor a walk through its neighborhoods full of history, the best place to enjoy the Carnivals or the fish of the Bay, the Old Town where most of the monuments are grouped, and above all, of its people. Origen del carnaval, The Carnival of Cadiz in the street and more at..